The pace of producing United States coins for circulation picked up in September after slowing to an eight-month low in August but it ran slower than a year earlier, according to manufacturing figures published today, Oct. 4, by the U.S. Mint. Nearly 977 million in cents, nickels, dimes, and quarters were pressed for circulation last month, lifting the year-to-date production total to more than 10.1 billion coins. The Federal Reserve always orders more 1-cent coins than any other denomination even as it costs the U.S. Mint 1.82 cents to make and distribute each one. The Mint produced 561.6 million Lincoln cents in September, representing 57.5% of the circulating-quality coins produced for the month. 15.7% for America the Beautiful quarter dollars. Native American $1 Coins and Kennedy half-dollars are no longer ordered by Federal Reserve Banks but they are still made in circulating-quality for coin collectors. 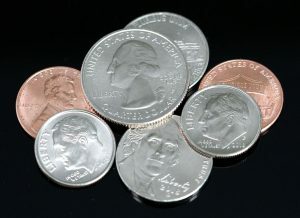 In January, the U.S. Mint tends to make both coins to the expected amounts needed for the entire year. The U.S. Mint in February did strike 1.8 million more 2018-D Kennedy half-dollars. Then in March it made another 3.2 million from Denver and 1.2 million more for Philadelphia. No more have been pressed since then. Mintages for the half-dollar are at 5.4 million from Denver and 4.8 million from Philadelphia for a combined 10.2 million coins — the most since 2001 and more than doubling those made in 2017. Last year’s release ended with splits of 2.9 million from Denver and 1.8 million from Philadelphia for a combined 4.7 million coins. U.S. Mint facilities in Denver and Philadelphia manufacture all of America’s coins for commerce. Last month, the Denver Mint made 470.52 million coins and the Philadelphia Mint made 506.3 million coins. Year-to-date figures at 4,893,540,000 coins from Denver and 5,257,814,000 coins from Philadelphia total to 10,151,354,000 coins, marking a 10.4% reduction from the 11,326,700,000 coins minted through the same time last year. The 2018 monthly average of nearly 1.13 billion coins tracks over 12 months to roughly 13.5 billion coins. In 2017, the U.S. Mint produced over 14.8 billion coins for circulation — the third quickest for a year since 2001, after the more than 16 billion coins were made in 2016 and the over 17 billion coins were made in 2015. 2018 Pictured Rocks National Lakeshore quarter for Michigan, released on Feb 5. 2018 Native American $1 Coin, released on Feb. 15. 2018 Apostle Islands National Lakeshore quarter for Wisconsin, released on April 9. 2018 Voyageurs National Park quarter for Minnesota, released on June 11. 2018 Cumberland Island National Seashore quarter for Georgia on Aug. 27. Mintages for the 2018 Native American dollars are 2.1 million from Denver and 1.4 million from Philadelphia for a combined 3.5 million coins. Last year’s release ended with splits of 1.54 million from Denver and 1.82 million from Philadelphia for 3.36 million coins. Production figures for September include 230.6 million quarters that have yet to be officially assigned to a design. These are a portion of Cumberland Island quarters that started circulating Aug. 27.
why no article on limited edition silver proof set?